How Do Straight Teeth Improve Your Oral Health? While many people only think of straight teeth from a cosmetic standpoint, there are actually important benefits to the health of your mouth. Crowded teeth provide the perfect hiding places for plaque and tartar, which are mainly made of bacteria. These bacteria are responsible for causing cavities and gum disease, and can create the need for extensive dental work that most people would rather avoid. With straight teeth, it’s far easier to be effective when you brush and floss. Not only will your smile be cleaner, it can help reduce the staining that accumulates around crowded front teeth. In addition to the benefits to your teeth and gums, straight teeth will have a far-reaching impact on your confidence! Being able to laugh and smile without feeling self-conscious is incredibly important when you’re socializing or interacting in a professional environment. Other people will pick up on that confidence and respond to it in kind. Are Braces Your Only Option? For decades, traditional braces were the only option for people with crooked teeth. Fortunately, there have been incredible dental advances made in recent years that have improved the entire process of straightening teeth – from start to finish. 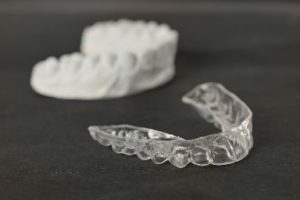 Instead of brackets and wires, Invisalign in Collierville uses clear trays (called aligners) that are similar to a night guard or athletic guard, but thinner and more comfortable. And of course, they’re practically invisible to other people! These aligners will move the position of your teeth by a small amount. Then you’ll wear a new set of trays every 1-2 weeks that will make further changes until the final result is achieved. The time it takes to complete Invisalign treatment varies from person to person, but the average time is about 12 months. With this alternative treatment option, you can have the straight smile you’ve always wanted without the discomfort or inconvenience of traditional orthodontics. Dr. Joshua A. Holcomb is committed to excellence in everything he does. Each year he pursues almost 10 times the required amount of continuing education so that he can offer his patients the absolute best in dental care. He also enjoys offering new technology like Invisalign so his patients can straighten their teeth without the drawbacks of braces. He can be reached for further questions via his website, or at (901) 850-0300.